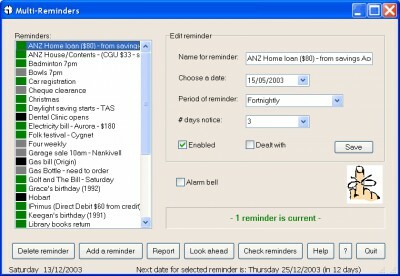 Multi Reminders 2.6 is other software developed by Kevin Solway. A program to remind you of birthdays, bill payments, and appointments. Reminders can be periodic (eg, weekly, fortnightly, monthly, quarterly, yearly). And you can specify how many days notice to give you. Checks for reminders every time you startup your computer. Create and print monthly wall calendars containing your reminders. This other software is freeware, which means you can download and use Multi Reminders 2.6 absolutely free. There's no need to buy the product. Multi Reminders 2.6 supports English interface languages and works with Windows 98/XP/Vista. We have tested Multi Reminders 2.6 for spyware and adware modules. The software is absolutely safe to install. Our website has thoroughly tested home & hobby product Multi Reminders 2.6, written the review and uploaded installation file (301K) to our fast server. Downloading Multi Reminders 2.6 will take several seconds if you use fast ADSL connection. Create reminder messages for important events. A smart reminder manager that reminds you about important events in advance. 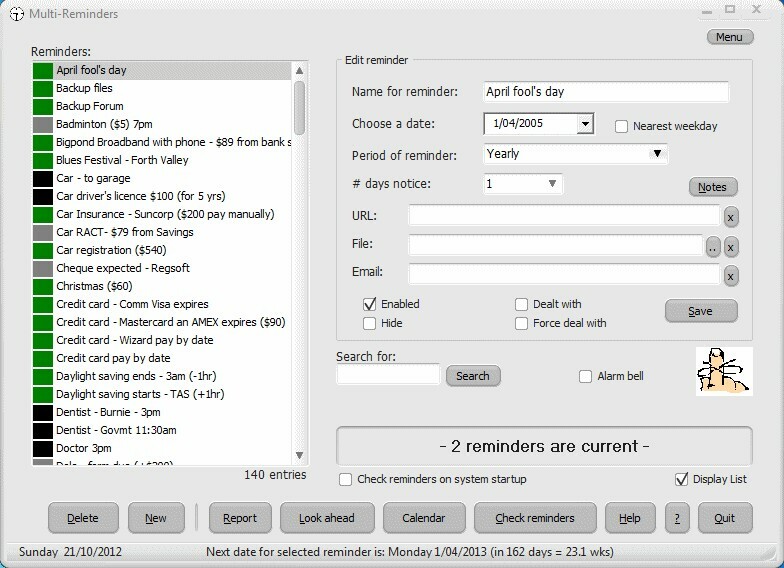 PreMinder is an easy to use calendar program. Turn Your PC into a Reminder Service, with Gifts 'n Reminders!